It’s Lanford Wilson’s turn to be rediscovered. Like his great precursors, Tennessee Williams and Arthur Miller, his dramatic reputation rests on a substantial body of early work followed by a long period of diminished and unheralded productivity. Wilson was among the most fertile of the generation that gravitated to New York City in the 1960s in a period of accelerating esthetic and political change. In churches, coffee shops, and theatre cafes, Wilson and his playwright contemporaries experimented thematically by introducing hitherto suppressed subject matter (e.g., homosexuality), and formally, by moving beyond the constraints of realism. But although Wilson fractured the surface of illusionism, he did so gently, not radically like his contemporary Sam Shepard; Wilson refused to abandon the conventional dramatic verities of coherent character and plot, and over the course of several decades has written more than forty long and short plays, the most popular being Hot L Baltimore (1973), about the marginal denizens of a soon-to-be-demolished railway hotel, and Talley’s Folly (1979), an uncharacteristically optimistic valentine to two rebel eccentrics. The estimable Signature Theatre Company has for more than a decade dedicated each theatre season to offering a selection of work by one significant, if not always well-known, American playwright; honorees include Horton Foote, Arthur Miller, Adrienne Kennedy, and Maria Irene Fornes. That Lanford Wilson, often considered but unchosen until now, has finally received his recognition is undoubtedly due to the fact that until 1996 he was one of the few playwrights blessed with his own theatre. In 1969 Wilson, Marshall Mason, and several actors co-founded the Circle Repertory Theatre, which, until its demise six years ago, produced all of Wilson’s plays. With the Circle gone, Wilson’s dramatic voice grew more and more distant and so Signature has chosen to reamplify it. It may well be asked, however, whether the play they’ve chosen to initiate the season was an ideal choice. 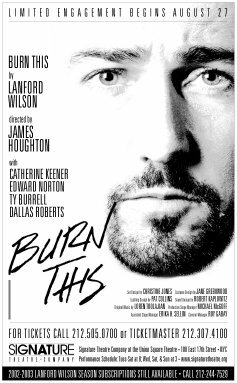 Burn This was produced in 1987 by Circle Rep on Broadway starring John Malkovich and Joan Allen where it received a mixed critical reception. There was no denying the power of the performances of the leading actors, but many (including this reviewer) had serious problems with Wilson’s play. Briefly, the play centers on the personal crisis of Anna, a rising downtown dancer/choreographer, and the men in her life: a gay ad exec with whom she shares digs, a commercially successful screenwriter who is in love with her, and, above all, the wild and unpredictable brother of the gay dancer who also shared her loft and who had been central to her creative life, but who has just been killed in a tragic boating accident. The wild brother, who has arrived in the middle of the night to collect his brother’s things, seems the antithesis of his sensitive dead brother: coarse, insulting, truth-telling to a fault, above all dangerous. The trajectory of the play is the coming together of the unlikely pair of the dancer and the wild man. On one level it’s a standard Romantic ending–choosing the free spirit over the solid but stolid suitor (as in, for example, Holiday, The Philadelphia Story, The Graduate). On another it’s a lesson in Wilsonian pessimism: emotional need will overwhelm rational considerations, sensibility will always conquer sense. But despite the genuine passion that it fitfully displays, despite the sheer verbal pleasure of much of Wilson’s dialogue, the play lumbers to its conclusion. The boy/meets/loses/gets girl process is stretched out painfully, alternating scenes between the central pair with long repetitive scenes between Anna and her other male pals in which matters relevant and otherwise are hashed and rehashed. In the current production the problem is exacerbated by director James Houghton’s indulgence of the current actors’ assiduous drive for true motivation. The result is an enervating running-time of over three-hours. There are other dramatic problems. It is disquieting, for example, to realize now how simplistically Wilson, despite his own gayness, uses Larry the gay ad man as a wise-cracking fount of emotion-deflecting quips ("I’m not an opera queen; I rank no higher than Lady-in-Waiting") without any real serious consideration of his problems. The play’s faults are made more obvious in the current production because the two main actors do not seize the histrionic opportunities their roles present as did their 1987 predecessors Joan Allen and John Malkovich. Despite the excellence of much of their screen work, despite the obvious seriousness in which they have approached their roles, Catherine Keener (ironically Oscar nominee in Being John Malkovich) and Edward Norton do not have the stage presence, the sheer size to dazzle and make us really care what happens to them. Sad to say, Keener does not project the attractiveness to credit the assumption that men are fighting for her. And Norton, another excellent actor, cannot overcome his own physical lack of distinction. A whiter shade of Pale indeed. Pale is one of those impossible over-sized characters like Stanley Kowalski or Jimmy Porter whom you love despite their often hateful aggressiveness. Beneath the Macho posturing must lie a sympathetic core of vulnerability. But flawed as the play and the current production may be, there is much here to reveal Lanford Wilson’s virtues: the power of his dramatic observation, his humor, his skillful craftsmanship in creating dramatic dialogue and atmospheric scenes, his exploration of important themes about current malaise, and his sympathetic portrayal of marginal and eccentric characters.